Dental sterilizers pose a health problem when not used correctly. Midtown Dentistry uses Class B sterilizers to provide better long term sterilization and improved safety. With a new Elera sterilizer purchased, Midtown Dentistry joins other premium dental offices that use Class B Dental sterilizers to provide better sterilization to their patients. In order to understand why these are ground breaking sterilizers, one has to understand sterilization. 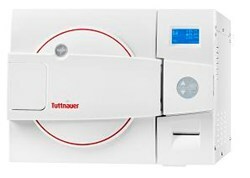 Class S sterilizers are the majority of sterilizers in dentist offices. Pre-vacuum sterilizers (Class B) have been available for many years in hospitals, dental schools, and large clinics, but they have only recently been available in the United States for dental offices. These new small sized sterilizers are called Class B - taken from the European Standard, which provides requirements for small steam sterilizers. In usual dentist sterilizers, the instruments are steam sterilized and then removed. Because of the steam, the bags have moisture when removed, and if not used immediately, the moisture causes bacterial and spore growth and corrosion on the instruments. Class B sterilizers use pre-vacuum. This means the instruments are dried under vacuum before they are removed from the sterilizer. The instrument sterilization bags are thus sealed better. The advantage is no moisture in the sterile bag and dry instruments.-. This reduces the chance for bacterial and spore growth as well as corrosion. The only downside to these devices is the higher initial cost and higher maintenance cost over time.